So you think you might want a swimming pool, but it costs too much money. So you thought about getting a hot tub spa instead, but they seem to be just too small. Don't you wish that someone would invent something that had all the best features of a pool and a spa combined, but at a really reasonable cost ? Well, your wish has come true because although Swim Spas have actually been around for a few years, they are just now becoming much more popular and much more available throughout most of the USA - and the rest of the world too ! Quite simply, a Swim Spa is a machine that allows you to swim continuously against a water current. You never "hit the wall" or have to turn around to continue to swim laps like in a regular pool or a lap pool. 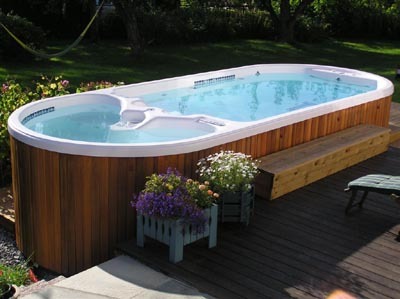 Swim Spas provide the absolute best swimming exercise work out, using the least amount of space in your home or yard. Swim Spas also act as smaller swimming pools in the sense that you can play around in them, or with some of the split-models, you actually have a hot tub spa in one end of it and a swimming area in the other end. Visit Our Swimming Pool & Swim Spa Buyers Guide & Manufacturer's Links for a complete list of all the major manufacturers of Swim Spas and take a look at our new page, What is a Swim Spa ? to learn more and see many photos of the different types of Swim Spas on the market today.